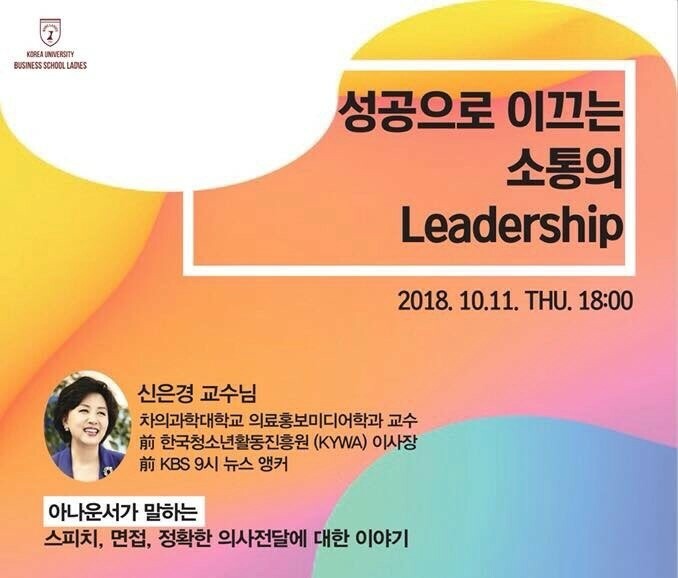 Led by Korea University Business School (KUBS) Ladies, a speechmaker was invited to deliver a talk about the way of communicating. Having worked as a professional news caster at Korean Broadcasting System (KBS), Professor Shin Eun-kyung (Department of Health and Strategic Communication, Cha University) lectured about communication skills on October 11, at the LG-POSCO Business Hall. According to Professor Shin, being a good speaker means being a good listener. She emphasized to be all ears when someone talks. “A person of high integrity is able to speak well. It is the attitude that matters,” said Professor Shin. She added that verbal language is not all; non-verbal language, such as nodding, is another good way of communicating. Not just confined to effective speech communication, the lecture covered an optimistic view of life. Professor Shin told students to challenge, to make a chance and to change. As the professor said, only the challengers make the chance. It is expected that the lecture would provide an instructive information for KU students preparing for a group presentation or a job interview. Besides, through the discourse, KU students could grab an opportunity to be confident and highly motivated by the lecturer and the advisor.